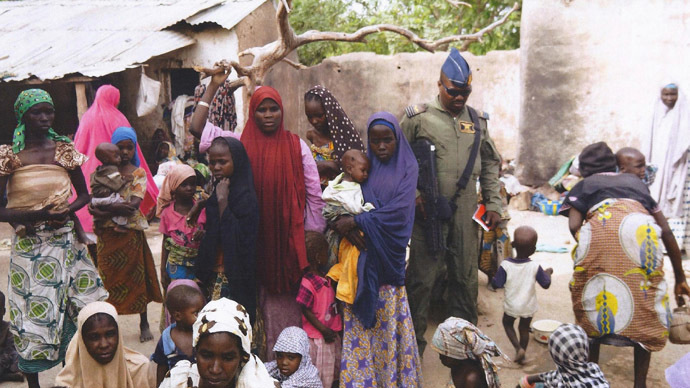 The Nigerian army has announced it secured the release of another 234 women and children who were being held hostage by Boko Haram militants in their stronghold in Sambisa forest, bringing the total number rescued over the past few days to more than 500. The Nigerian defense headquarters said in a statement that their Thursday operation against Boko Haram camps in the Kawuri and Konduga end of Sambisa forest resulted in the release of 234 captives, AFP reports. Earlier the army said that about 160 hostages, including some 100 children, were rescued in that operation. It was unknown if any of the rescued were from a group of young Chibok schoolgirls who were kidnapped last April, over 200 of whom still remain missing. At least one woman was killed in the firefight as the extremists used hostages as human shields, APF sources indicated, while in some cases women even fired back at Nigerian soldiers. Authorities are yet to confirm the identities of the freed persons, as all of them are being screened, authorities said earlier. The new operation brings the total number of rescued Boko Haram hostages to over 500 this week. In an massive operation against militants on Tuesday, the Nigerian military managed to free “200 abducted girls and 93 women”. It was later confirmed that none of them were from the group of Chibok victims. “There is great hope for recovery of more hostages of the terrorists,” Defence spokesman Chris Olukolade said Thursday. Nigerian army already cleared a number of “terrorist training camps” and promised to “comprehensively” sweep the forest of the militants.